Measure return on investment (ROI). While social media efforts often start as tests, as more corporate resources are used, firms require better methods of tracking contribution towards company goals. When companies start tracking social media results, their metrics are less sophisticated. Further, social media’s impact on bottom line results can be difficult to determine since it may occur before the formal shopping process or help support post-purchase use so that it’s not tracked. Develop and execute integrated social media strategy. Done right social media requires support from across your organization including marketing, communications, PR, customer service, product and human resources. To this end, get human resources and the rest of your team involved in the process early. Have corporate social media guidelines. Regardless of whether your firm is actively involved on social media platforms or not, it’s critical to have a set of policies outlining how employees should act on your behalf, how employees should act as individuals, and how consumers and the public should act. These guidelines can be short and to the point. For example, Ford’s social media policy contains five points on one page! On a related note, it’s a good idea to have a well-documented crisis management plan as well. Gain senior management support for social media. Often businesses need to test or make a strong case for how social media will enhance the organization’s ability to reach its goals before senior management fully buys in. The paradox is that to get companywide support and appropriate resources, budget and employees, need senior management on board. Dedicate at least one employee to social-media activities full-time. Having an employee focused on social media related work is a critical point for most companies. Contrary to what many people think this employee isn’t wasting time chatting with friends on Facebook. Rather this person must be engaged with your target constituents on the social media platforms that are critical to your business. Fully/well-developed strategy is very uncommon when an organization first starts using social media. 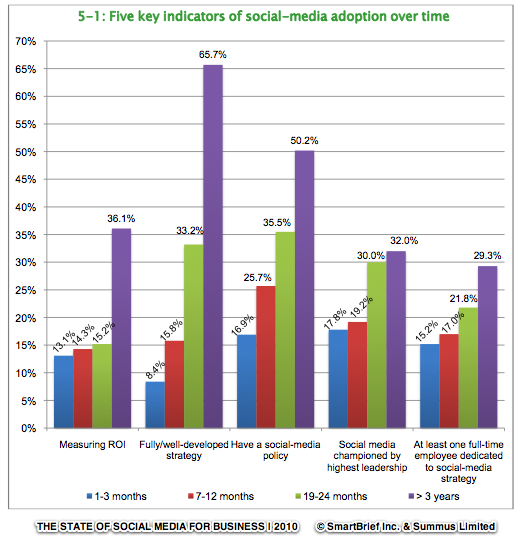 But after three years’ experience with social media almost two thirds of businesses adopt a formal strategy. This is a confirmation that most business users of social media start by testing to find out what works for them, and then commit to a formal strategy after they have some experience. Almost half of the organizations surveyed still don’t have a formal social media policy even after three years experience, (Troubling, yes?) It means that they haven’t started to match their involvement to their corporate goals. Only one third of respondents felt social media wasn’t championed by its highest leadership, even after three years experience,. It seems that the senior leadership of many businesses, even those actively using social media, doesn’t yet fully “get” this new marketing and communications platform. Formally measuring ROI is only done by only about 15% of businesses for the first two years. After year three, this number jumps to over 36%. This seems to indicate that it often takes three years before the resource commitment gets high enough to require formal ROI monitoring. Less than half of companies with a mature social media strategy have a full time employee dedicated to social media. Therefore, some of these firms could be missing an opportunity to get the most out of their strategy. Given the maturing use of social media by many companies, you should track your firm’s progress against these indicators. As your organization becomes more sophisticated in its social media use, make sure you incorporate appropriate budget and human resources to ensure that you’re able to accomplish your social media goals. This will be particularly important for 2011. How is your firm tracking against these indicators? 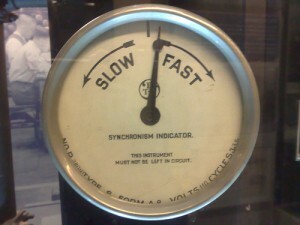 What other indicators are you using to monitor your company’s progress? Please add to the conversation in the comment section below. Tags 2010 State of Social Media for Business, SmartBrief Inc, Social Media Guidelines, Social Media Policies, social media ROI. Bookmark the permalink. Thank you for your article. I’m more than a bit dubious about such self-reported survey findings, and while they might give some indication of a trend, they are far from definitive. But, I’m sure I’m preaching the the converted. I find it interesting to note the findings that so many senior managers were on board with social media. I suspect some of that alleged interest may be posturing. Senior management often don’t want to seen as Ludites and so, while they may not be sold on something, may state they are. I wonder if there have been any studies on the measuring accuracy of self-reported findings? Simply wanted to say that your article is as astounding. The clearness in your post is just great and i can assume you’re an expert on this subject. I’m grabbing your feed to keep updated with forthcoming posts. Thanks a million and please continue the enjoyable work.